DESTINATION: FAIRMONT MAYAKOBA GIVEAWAY, QUESTION #1! Hi friends! Here is the first question you will need to answer to enter the Stephanie Johnson Riviera Maya Collection giveaway and be entered to win the grand prize of a Riviera Maya Getaway: What are some of the ways that Fairmont Mayakoba, Rivera Maya is eco-conscious? You have until Monday, January 9th at 9 p.m. EST to post your answer. Additional contest info can be found on Fairmont Mayakoba and Stephanie Johnson‘s Facebook pages. Buena Suerte! What an ABSOLUTELY gorgeous jewel of a resort! So glad to hear that the resort is working hard to preserve the natural beauty of the area while providing top notch eco-friendly accommodations. Who wouldn’t want to enjoy a leisurely bicycle ride around the property or enjoy the water up close by riding one of the lanchas boats. Even the golf carts are electric. I can’t wait to visit. Eco-conciencia es realizada a través de la responsabilidad social tomando conciencia, realizando mejoras en la conservación del agua (sistemas de reciclaje de agua) y de energía (iluminación de bajo consumo de energía) y energía verde, reciclado (minimizando desperdicios) aplicando estrategias como la conservación también de especies, limpieza de ríos y playas, todo comienza desde el respeto hacia la ubicación del hotel haciendo participes a los huéspedes al igual que empleados y crear una educación ambiental. Eco-conscious is due through social responsibility by taking conscience, making improvements in the water conservation (by recycling water systems) and also with energy (low consume ilumination energy) and also by using green energy, besides recycling (minimizing waste) applying strategies as well as the conservation of species, beaches and rivers cleaning, it all starts from the respect to the location of the hotel, by making guests and as well employees to participate and create an environmental education. Congratulations, Judyth, you are our week #1 winner! Please email sarah@stephaniejohnson.com with your address details so we can send you your Riviera Maya collection! Such a gorgeous resort, I’ve heard great things from a fellow mom who went for a long weekend w/out kids! The resort’s efforts to protect the environment include organic and sustainable menus, waste-free meetings, and group eco-tourism. Looks like a fabulous resort. It is eco-conscious. It has five different ecosystems -mangrove, tropical forest, lagoons, water canals, and coastal dunes.It seems like a dreamy place to vacation in. Sustainability – Our green resorts’ sustainability efforts encompass everything from recycling and organic waste diversion in the hotel’s kitchens to retrofitting energy-efficient lighting. Seeing that the answers are above, I can only share with you my experience at Fairmont Mayakoba. Our first experience was four years ago when we were looking for a wedding venue in Playa del Carmen area. From the luxurious entrance way into the property to the incredible gondola ride through the marsh, utterly breathtaking. As you would imagine, the service was impeccable from the front door staff to the ground keepers. Everyone breathes hospitality. Since that experience four years ago, we’ve gone back every year for our Anniversary. We returned this past weekend for an all-day spa at Willow Stream, awesome! Thank you for having this contest Stephanie, the winner will really find themselves lucky. Please let me how I can buy your products online, would make a great surprise gift for my wife. Thank you to everyone who shared such glowing reviews and comments of our eco-concious resort! We were happy to read everyone’s posts which included such detailed information on the numerous ways our resort strives to maintain green standards throughout. Please visit us at Fairmont.com/Mayakoba for more information. If you haven’t already done so like us on Facebook (http://www.facebook.com/FairmontMayakoba) and follow us on Twitter (http://twitter.com/fairmontMYK). Good luck to all! 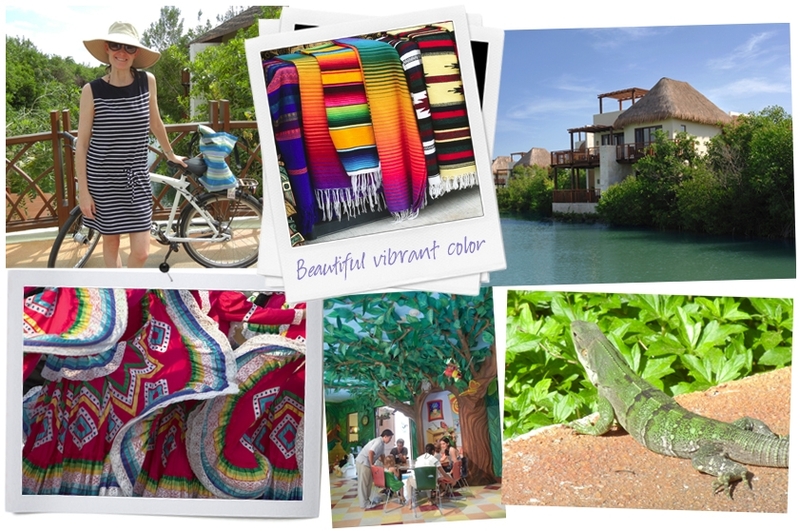 I love that the Mayakoba is all-around eco-conscious and committed to their natural surrounding as well as the local foods and traditions — truly celebrating what makes the Riviera Maya special and unique. With sustainable menus (mm, lobster! ), Mayan-influenced spa treatments, and alternative options like bikes and electric golf carts to get around, the Mayakoba infuses authenticity into each of their offerings and amenities. I would love to visit a beautiful, tropical resort that cares as much about local history and sustainability as it does about their guests. « DESTINATION: FAIRMONT MAYAKOBA GIVEAWAY!